Press Conference in Lima, Peru 10/29. Press Conference in Lima, Peru 10/29. Wallpaper and background images in the The Jonas Brothers club tagged: nick jonas jonas brothers joe jonas joe kevin jonas jonas. 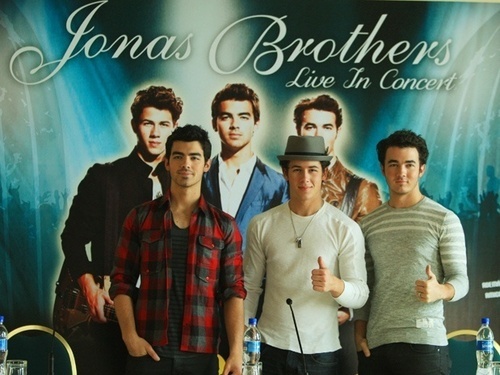 This The Jonas Brothers photo contains sign, poster, text, and chalkboard. There might also be well dressed person, suit, pants suit, pantsuit, workwear, outerwear, and overclothes.